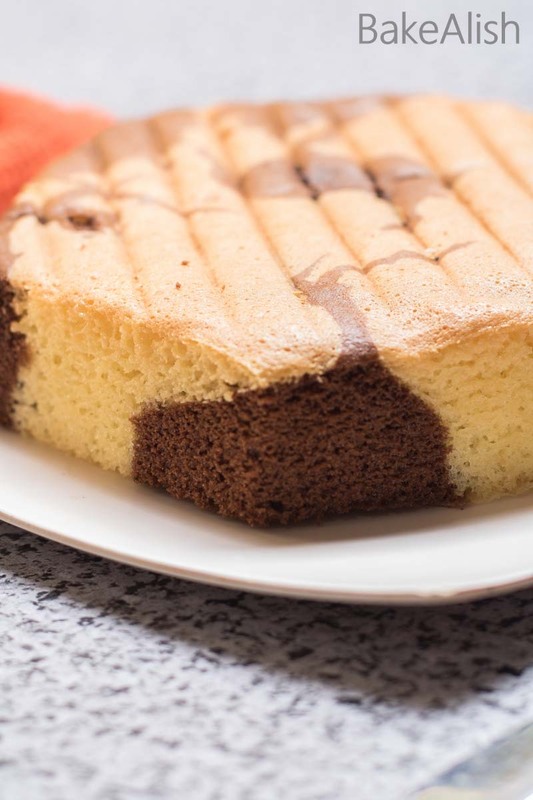 Chocolate Marble Chiffon Cake is a combination of vanilla and chocolate baked together. 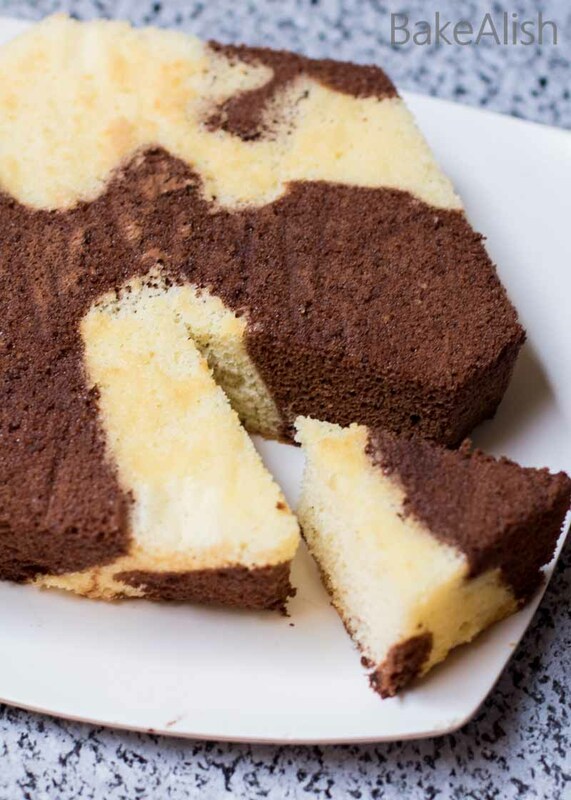 This marble chiffon cake is moist and delicious. It’s easy to make and a perfect chai time edition. Try this one, its one of those recipes you would want to note down for life. 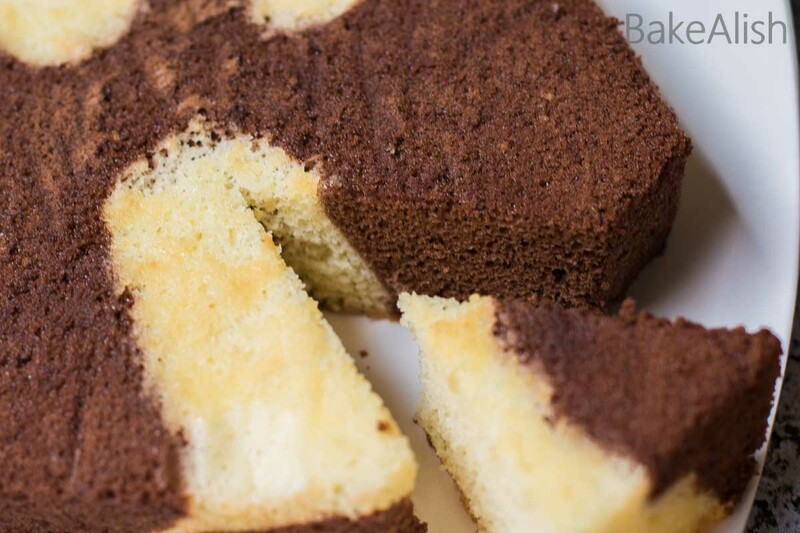 The internet is loaded with chiffon cake recipes however not all of them feel like chiffon. When I think of a chiffon cake, I expect it to be super light, moist and delicious. One of the most popular recipes on my blog is the Orange Chiffon Cake recipe. It received so much recognition because of its perfect airy texture and milk flavors. I’m so saturated baking cakes that I hardly eat them. The cakes I bake are normally consumed by friends and family and always excited neighbors who wait to join in some baking. But this one is special. 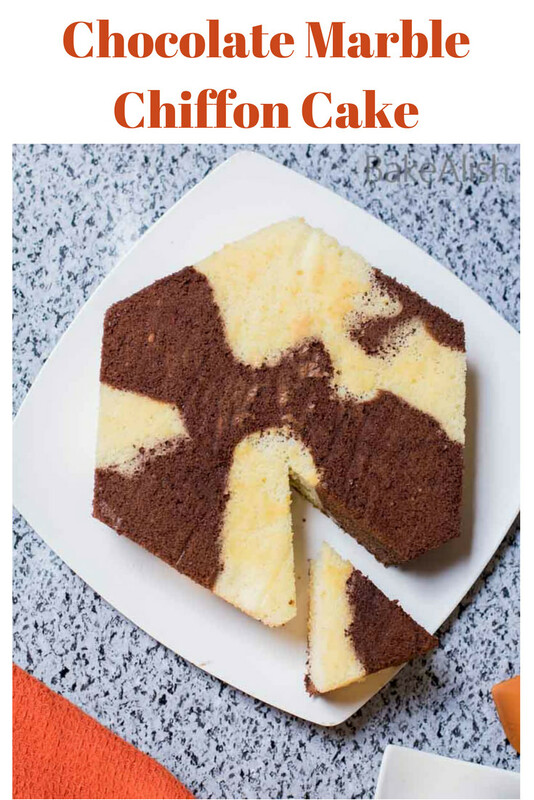 I enjoy biting into this Chocolate Marble Chiffon Cake any time of the day. It’s so light and yum that even a saturated baker like me cannot stop !! You can use egg replacement powder. The main ingredient in this cake batter is egg whites. After the egg whites are beaten you’ll notice that its literally 3 times or more as compared to the prepared cake batter which needs to be combined. Do not overfold the batter. All you want to do it combine all the ingredients. If you overwork this batter, the egg whites will lose it fluffiness and yield a flat cake or probably an eggy textured cake. To retain the fluffy cake texture & volume, and also to make sure the eggs retain its light and airy feel this cake needs to be tilted upside down immediately after it’s out of the oven. I tilt the cake dish onto a wire rack and let it cool completely. Most of the times, the cake falls off itself without struggling to take it off the dish. Traditionally this cake is baked in a tube pan but I bake them in any pan lined with baking paper on the base of the dish (not for the sides) Do not grease the dish with any fat like butter or oil as the cake needs to cling to the sides while baking. Mix well and fold in the self-raising flour. Once done, set this mixture aside. In another bowl roughly beat the egg whites and cream of tartar. Beat until soft peaks are formed. At this point keep adding 140 grams of sugar a little at a time and beat well until all the sugar is well dissolved and forms really stiff peaks. 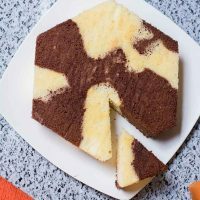 In a 9-inch baking dish lined with parchment paper at the base making sure it is not greased with butter or oil, pour 2 heaped spoons of the white batter (batter without cocoa powder) and 2 of the brown batter (batter with cocoa powder). Keep pouring spoons of the batter randomly all over the baking dish. 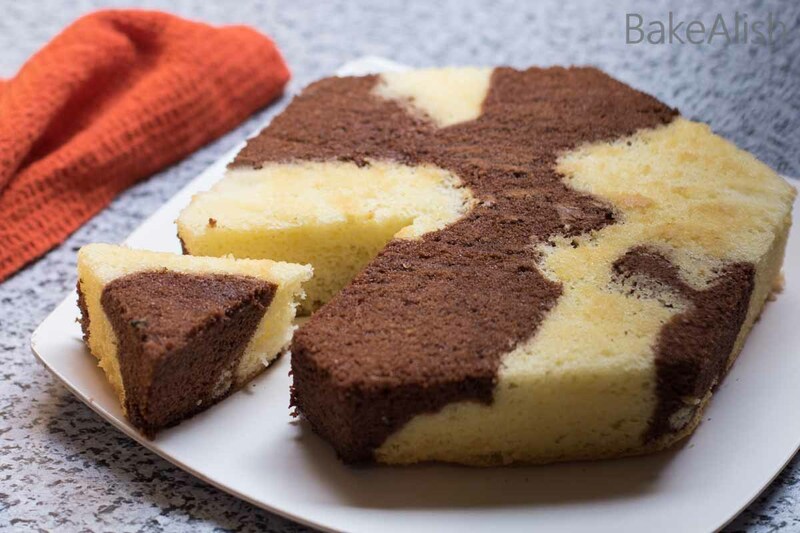 Do not overfill the baking dish with the batter as this cake rises quite high. Bake in a preheated oven at 170 degrees C for 50-60 mins. The cake should spring back when pressed in the center. That’s when you know it is well baked. After baking, let the cake cool upside down on a wire rack until it comes to room temperature. 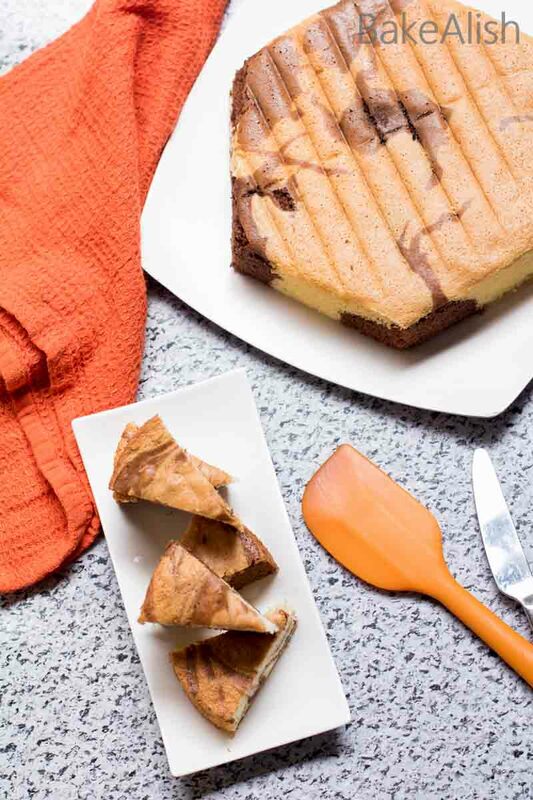 Pass a knife through the sides of the baking dish and unmold the cake. 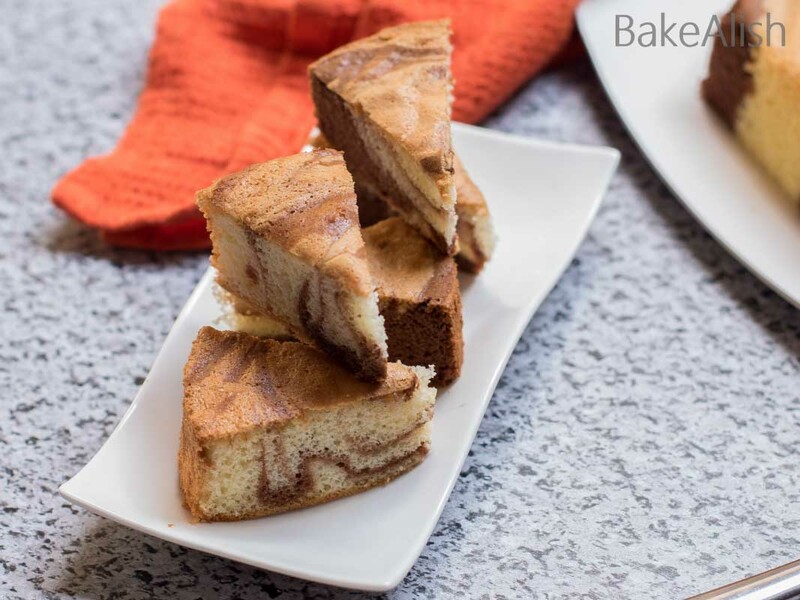 If you want some swirls in your marble cake lightly move a toothpick in the cake batter once poured into the baking dish just before baking. DON’T FORGET TO PIN THIS RECIPE ON PINTEREST FOR LATER. YOU CAN FIND MORE OF MY RECIPES ON MY BLOG PINTEREST BOARD AND FOLLOW ME ON PINTEREST FOR MORE AWESOME RECIPES. What a delicious cake recipe. I loved it too much.